It hurt my brain just to look at this smug, smarmy twit gloat over his belief that Richard Dawkins (and Heath Ledger, for that matter) are now (in the case of Heath Ledger) or will be (in the case of Richard Dawkins) burning in hell for all eternity. It’s guaranteed to raise your blood pressure–unless you’re a hateful bigot as well. Thankfully, B-grade horror movie sound effects that wouldn’t have been out of place in Plan 9 from Outer Space show up at the end to provoke hysterical laughter at the silliness of it all. I can’t help but note that it’s truly appropriate that these brain-dead morons call themselves the King of Terrors ministry. Actually, though, it would probably be more appropriate to call them the King of Clowns ministry, except that it would be an insult to clowns everywhere. 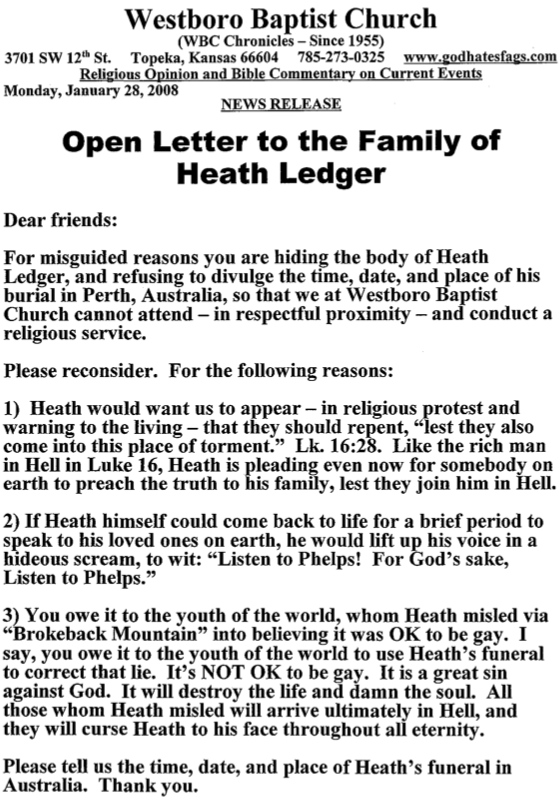 Ah, well, at least I can amuse myself with the antics of that even more hateful bunch of addled fundamentalists, the Westboro Baptist Church, as Ed Brayton tells us that chief nutcase “Reverend” Fred Phelps has issued an open letter to Heath Ledger’s family asking where the funeral service will be held, so that he and his fellow crazies can show up to do one of their patented hate-drenched “protests” against homosexuals because “Heath would want us to appear–in religious protest and as a warning to the living–that they should repent.” Gee, do you think Ledger’s family will tell them where the funeral will be? Truly, you can’t make stuff like this up. Who knew Hitler was a die-hard Cowboys fan?